Adesso! is a complete introductory Italian program that takes a communicative and functional approach to learning the language. The book emphasizes practical skills without compromising the formal skills of the language. 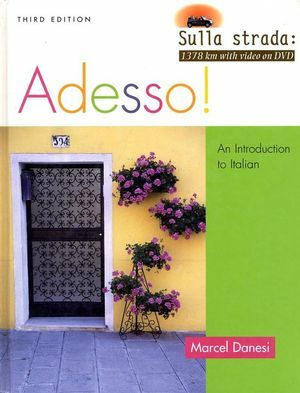 The objective of the text is to provide beginning students of Italian with a functional tool for learning how to use the Italian language in real-life situations. Its layout and activities are crafted to make the learning process both practice-oriented and task-based. The overall learning focus can be characterized in terms of a flow that moves back and forth between doing and practice phases. Combined with the Workbook/Laboratory Manual, CD audio program, and chapter-by-chapter Testing Program CD, Adesso! Third Edition continues to be a functional resource that will make learning Italian an enjoyable and meaningful experience. Marcel Danesi is a current Professor of Semiotics and Linguistic Anthropology at the University of Toronto. He is known for his work in language, communications, and semiotics and is the Director of the Program in semiotics and communication theory. 3. Si mi piace molto! 4. La lezione sta per cominciare! The design of each chapter is organized around themes which recycle information, affording the student ample opportunities to review and expand their knowledge of the language.